We are often asked if we have bridesmaid gowns, and YES we do! :) Here are our top 5 bridesmaid gowns for 2018 so far! 1. If you’re having a bridal party with all different heights and sizes, this is the must have gown! It’s so flattering on every figure and shows off the smallest part of the waist. 2. This A-line gown comes at #2 on the list and is also figure flattering. It’s romantic with a touch of glam because of the beaded bodice and flowy chiffon skirt. 3. How could we not fall in love with a dress that has a slit?! Plus the off the shoulder straps are flirty and help to frame your face. 4. 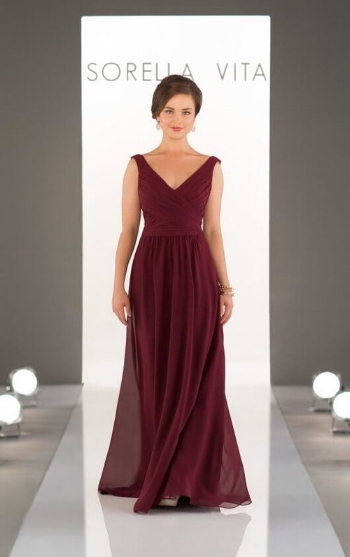 This bridesmaid dress is so classy! It features a v-neck and a cowl back that’s perfect to show off any up-do. 5. High necklines are in, and that’s what makes this dress so unique! We love how elegant this look is.